I used to walk Hooper in the neighborhood about three times a week. We had a set route that we'd take and I think Hooper had it memorized. I knew the exact distance that I could go that wouldn't leave me dragging him home or him tugging me further for more. It was good for both of us. I lost a few more pounds and Hooper got to pee on all of the plants. I let that evening walk go when I let go of Hooper. There are tons of excuses I could use, but really I just didn't want to walk by myself through the neighborhood. It seemed a little too depressing. The neighborhood had grown used to the sight of Hooper and I walking down the sidewalk. Now it would just be me walking down the sidewalk and I didn't think I could take any more pity stares. I left my walking to the treadmill. Over the weekend (after many poor food choices), Michael declared that we would walk every evening after dinner. I nodded my head in agreement, but set the idea aside. Sunday, after a long drive, grocery shopping and putting all of those things and everything else away, we sat down to eat pizza for dinner. Again, not really the best food choice. As I finished my slice of pizza, Michael took my plate and said "you ready?". It took me a few minutes to figure out what I was supposed to be ready for and when I realized he was serious about the whole walking thing, my immediate reaction was to whine about it. Except I didn't. I got up and put on my walking shoes. And we walked. We walked in a part of my neighborhood I hadn't walked through before. Both of us pointed out various houses that we liked as we walked or made note of how well this street was kept compared to a street over. I pointed out gardens and flowers. The peonies are in full bloom here along with the irises. 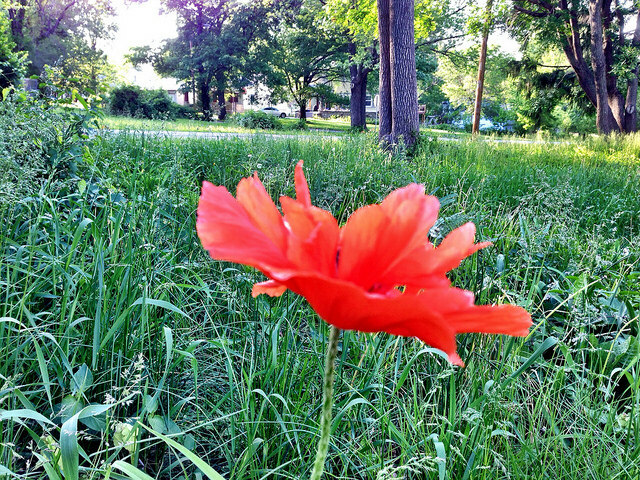 We even came across some wild poppies growing in the yard of one abandoned home. At the end of the walk I had to admit that I felt better. I was still tired from our weekend, but moving my body had relieved the damage done from sitting in a car all day. And so we have continued with our evening walks, taking a different path and exploring a different section of the neighborhood each evening. One house we passed had the biggest yard. I looked at it and said "all of that space? garden" and Michael agreed. I said we'd be real urban farmers then and what we didn't eat or sell we'd take to the food pantries. This is how all of the walks go, the two of us pointing out this house or that plant. People who are from KCMO always gasp when I tell them I live just east of Troost. Even Michael was leery. The area has a reputation and there are evenings when I lay awake listening to the police helicopter, but I've never had any problems and I've never felt unsafe. Michael started to change his view of the area soon after he moved in and then when we found that house that we (still) really want, my neighborhood was suddenly just fine. These evening walks through our neighborhood solidifies just how fine this place can be. I love noticing new things about this area that I never noticed before like how big all of the trees are or the way the helicopter seeds have landed in gutters so that they are standing on end. They look like they are waving at you. We passed a house the day before that looked like it belonged in the Swiss Alps, evergreen trees and all. This new activity could easily become my new favorite thing. Here's to discovering new things in my own backyard and happy Love Thursday!